At Unbucket, we’re fascinated by recipes because they are so much more than a means to create food. Passed down from grandparent to parent to child, recipes link one generation to the next. On Unbucket, we’ve seen numerous list items inspired by this idea; we even wrote a blog post about one of them. Baked into recipes are physical experiences, often shared with others. How many dates have started in the kitchen, recipes on the counter? Sure, we love to cook, but our fascination with recipes comes from their ability to unite individuals and draw people closer. So when a dear friend of Unbucket, Myles Grosovsky, proposed connecting us with Cookstr, we leapt at the opportunity. Cookstr’s mission is to organize the world‘s best cookbooks and recipes, and to make them universally accessible. They are actively setting the standard for innovation in the delivery of 100% trusted and tested recipes to home cooks around the world, authored by hundreds of the top chefs and cookbook authors. 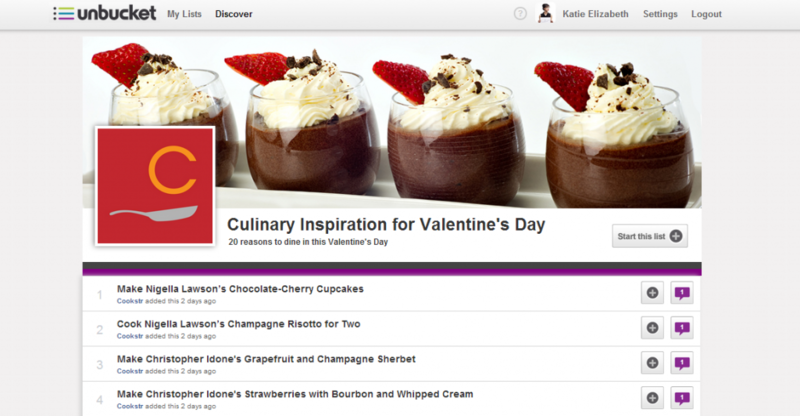 Thousands of recipes created by everyone from Mario Batali to Nigella Lawson to Jamie Oliver are available for free on Cookstr.com. We look forward to many more opportunities to collaborate with Cookstr, and we hope you use these lists to make the recipes your own to experience, enjoy, and ultimately, share with others. Kara is the Director of Editorial & Partnerships at Cookstr. She handles everything from project management to overseeing licensing agreements with publishers and rightsholders. She also writes the awesome Cookstr newsletter (you should subscribe). Kara is on the board of Girls in Tech NYC. At Cookstr, we aim to give people the tools they need to have better experiences around food. When it comes down to it, food is about relationships. And learning to cook is an exercise not only in sustenance, but in self-sufficiency. Those of us who love cooking know that we use it for experimentation, for meditation, for procrastination – and most of all, for celebration. Unbucket shares Cookstr’s belief that the best technology is a means to an end: better, more meaningful real-world experiences. We think that recipes are a great example of a digital object that can drive the kinds of in-person interactions Unbucket wants to encourage. 2. Can you share a personal experience with a Cookstr x Unbucket list item? I was on the phone with my mom yesterday, who lives halfway across the country, and she was telling me how excited she was about a new feature we launched recently on Cookstr, which allows you to save recipes into lists to help organize your cooking inspiration. She’s aiming to learn one new dish per week. My mom and I are planning a trip to Santa Fe together this spring, and we’re both going to cook Southwestern recipes from Cookstr while we make plans for our vacation. An Unbucket list is a great way to gather both the recipes we’re using as inspiration and our planned activities and destinations for the trip. This way, Unbucket memorializes not only the adventure itself, but the process of planning it. 3. In what way does Cookstr bring people closer? We see an interesting barbell in our Cookstr demographic. On one end, there are individuals, mostly women, in their 40s and 50s, home cooks who are comfortable in the kitchen but always looking for more practical inspiration. We think they’re drawn by the curated content, which our recipe editors choose entirely from published cookbooks by chefs and authors. On the other end, there’s a younger demographic, 20s and early 30s, largely in urban areas, a generation who’s completely invested in learning how to cook from scratch, challenging themselves, and bringing their friends together for potlucks and dinner parties. They’re drawn by the chefs we have on our sites – names they’ve grown up knowing, from Julia Child to Mark Bittman. They trust the chefs they saw on their parents’ shelves, although they’re not likely to go back to the print cookbooks themselves. Whether they’re parents getting a good dinner on the table five days a week or twenty-somethings trying to make osso buco for 10 in a thrifted dutch oven, Cookstr users understand that food is one of the most meaningful gifts you can share with another person.